The Veigel right hand controls are considered the premier hand control for reasons of quality, ease of use and appearance in the vehicle. The 4100 Classic is considered the most popular and easiest to drive of these premium hand controls. 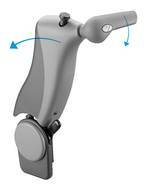 The unique accelerator motion allows the driver to adjust the seat close to the hand control without affecting operation. Please call us about our current wheelchair/handicap van inventory.